To date the biggest and best project structure I have worked on was completed just over a week ago. 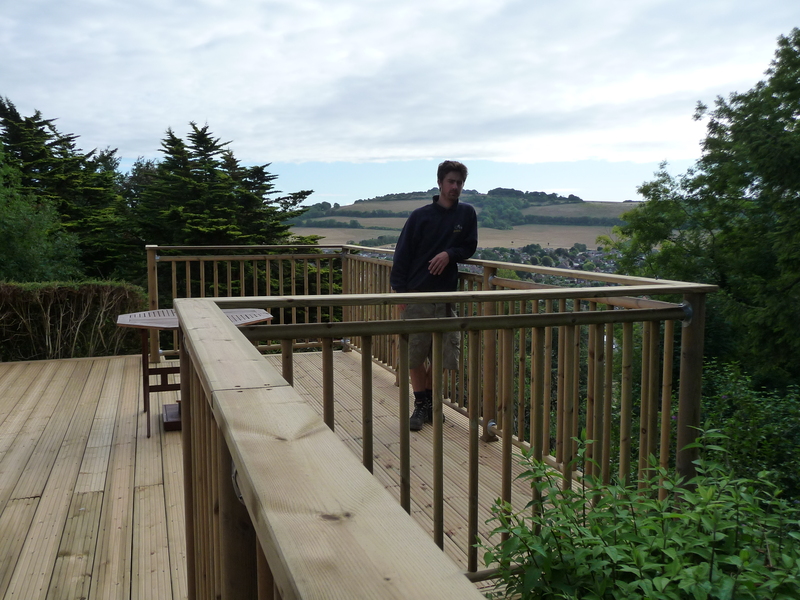 Set in the Findon Valley in West Sussex, overlooking the valley itself and the Downs beyond, now stands a newly-built, part-floating, Arbworx wooden deck; jutting straight out from the back of the house over the steep climbs of the garden. This was the site on arrival. Some of the pavers were very loose so we removed the dangerous ones immediately. The spot is surrounded by some beautiful, mature alpine trees, which divide to give the property its impressive view, around which the clients had set the main angle of the brief. Setting up tools and calibrating prior to starting the work. 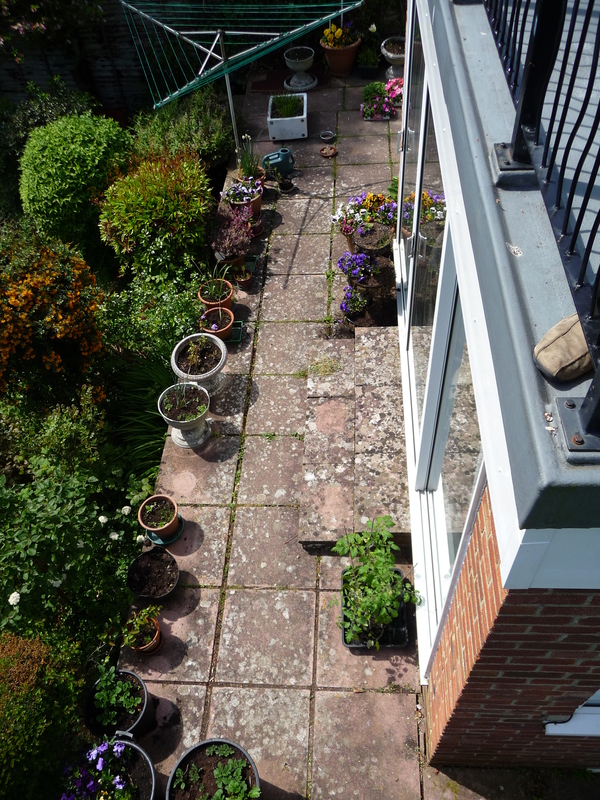 As it stood, the back of the house opened up onto a narrow patio area that had long passed its prime and was beginning to fall away down into the garden which, after a sheer drop of almost a metre off the edge of the paving slabs, started on a strong incline. This bank was also extremely overgrown and served as little more than a barrier to the rest of the garden, both visually and physically. Our task was to combine these awkward and challenging spaces to create a pleasure spot in the garden, which would extend the living area of the house, connect it clearly and conveniently with the rest of the garden and bring the surrounding landscape closer. The result of our work is an impressive wooden structure, the main area measuring around 5m by 5m that straddles the edge of the old patio and stretches out over the shrubbery below. We previously thinned the shrubbery out so that it contains only specimen plants. 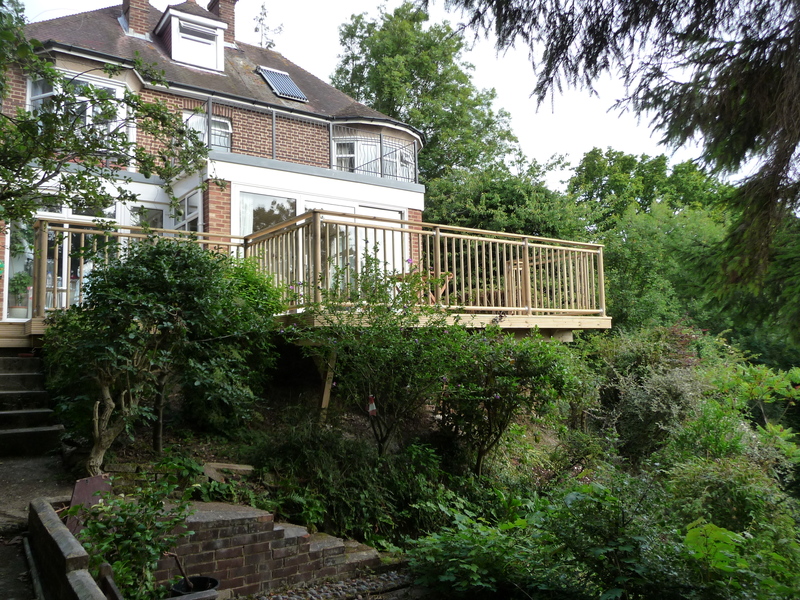 Ground level below the end of the deck is well over 2m down at the highest point and so a handrail system skirts almost the entire structure. The gradient that we had to overcome. 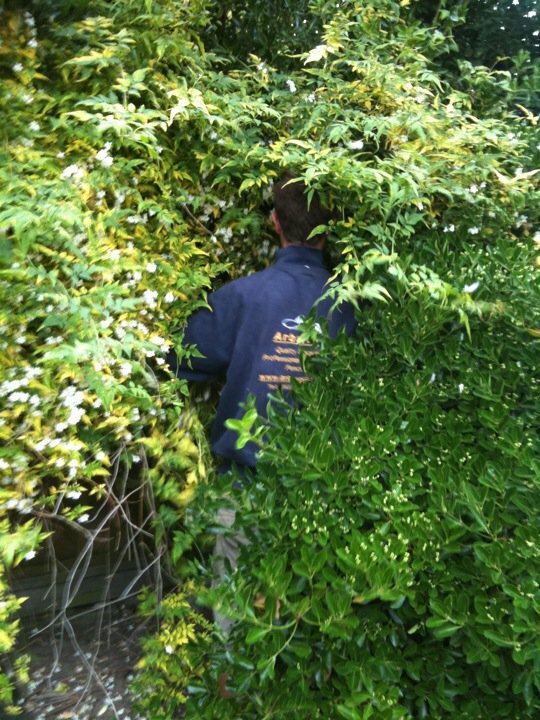 For this we chose a Richard Burbidge product which is both decorative and conforms to strict industry safety standards. 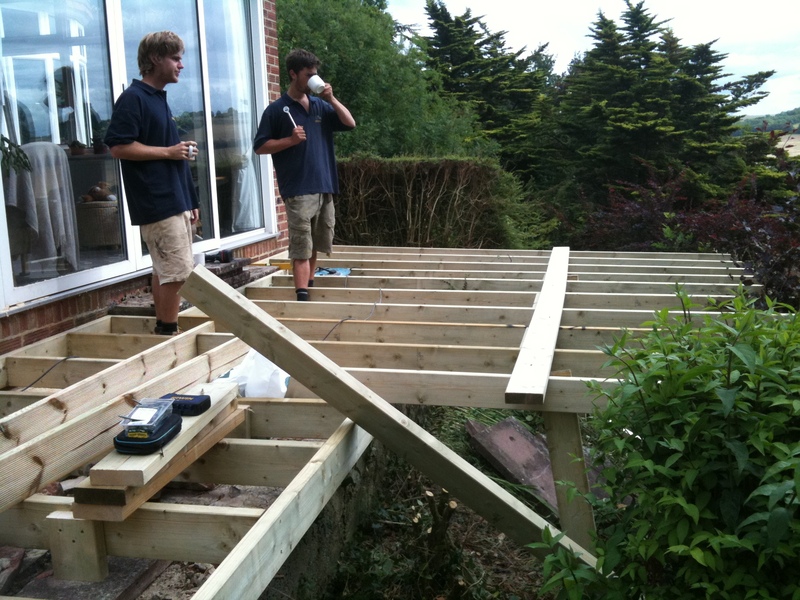 The overhang that creates this drop required some heavy-duty bolt fixing around the foot of the house and the installation of a supporting beam across the breadth of the deck, supported in three places by counter-angled legs from ground level set on sizeable concrete pads. 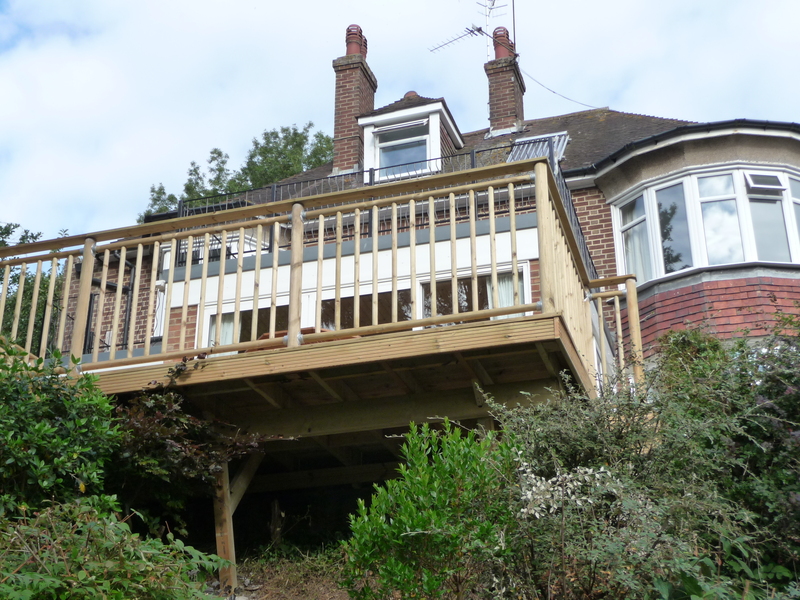 With an engineering background himself, the client had an acute eye for the load-bearing aspect of the build and at times acted as an extremely relaxed technical advisor! The finished item looks impressive from all angles of the garden, and even more so when softened within the shrubbery around it. However, it is also highly rigid considering that we used soft wood, much to my relief with such a trained eye in the house! 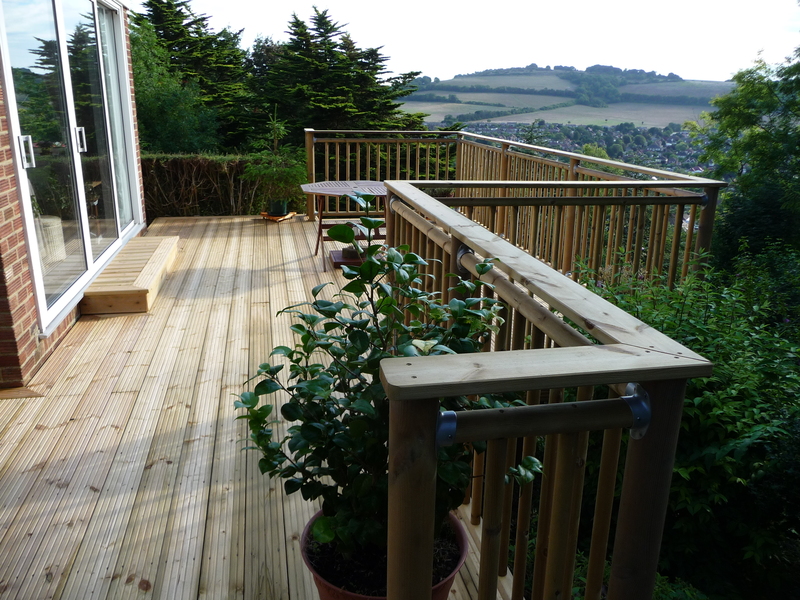 The build was highly successful as the deck provides an extensive, comfortable place from which to take in the stunning views and creates the perfect outdoor entertaining space, extending directly from the house. For me this is a landscape installation that definitely relates well with the house on a practical basis, but from an aesthetic point of view it also actively draws in its setting making it easier to loose yourself in the beauty of the surrounding area.